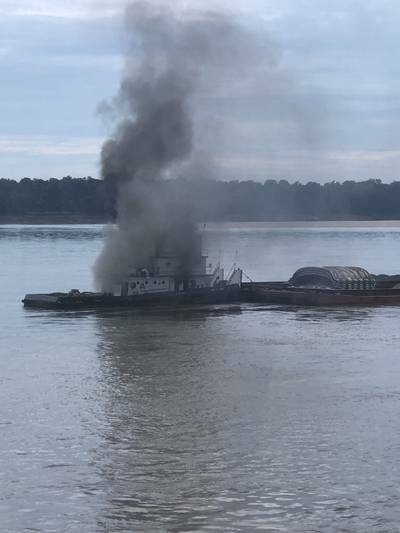 A section of the lower Mississippi River has been closed to vessel traffic after a tug caught fire near mile marker 673 on Wednesday. All crew is reported safe, and there have been no reports of pollution. The U.S. Coast Guard said it is responding to a fire on board the uninspected towing vessel Jacob Kyle Rusthoven near West Helena, Ark. after being notified of the incident at 10:30 a.m. The stricken vessel has been pushed to the Arkansas bank of the river where firefighting efforts continue. The vessel is reportedly carrying 13,300 gallons of fuel on board. Vessel traffic on the river has been restricted between mile markers 664 and 674.